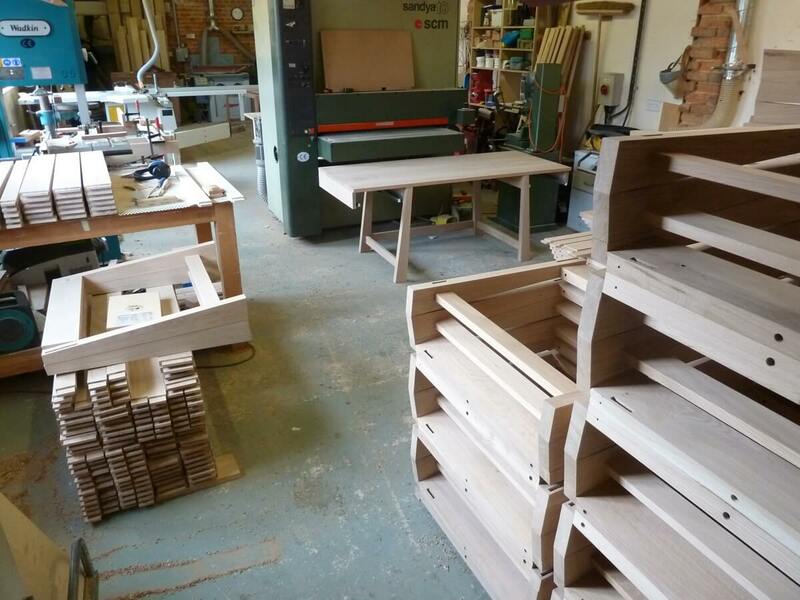 It’s been ages since i’ve done an ‘around the workshop’ round-up. We have some lovely images from exciting projects that we have undertaken since Christmas but not really had a moment to blog about them! The major news from our perspective was to land the big Oxford University job through Makers Eye just before Christmas. 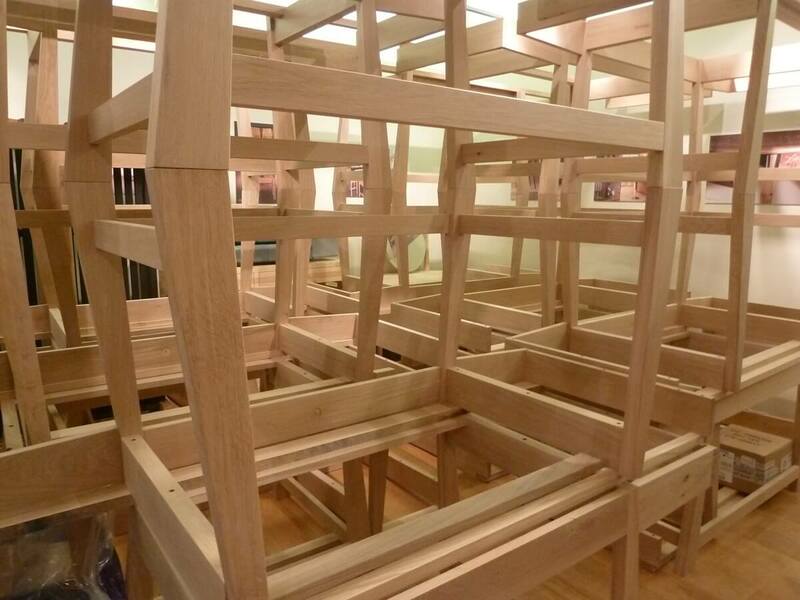 The pressure was on straight away as we only had 11 weeks to deliver 63 two-drawer desks and 12 folding tables, all in solid oak. 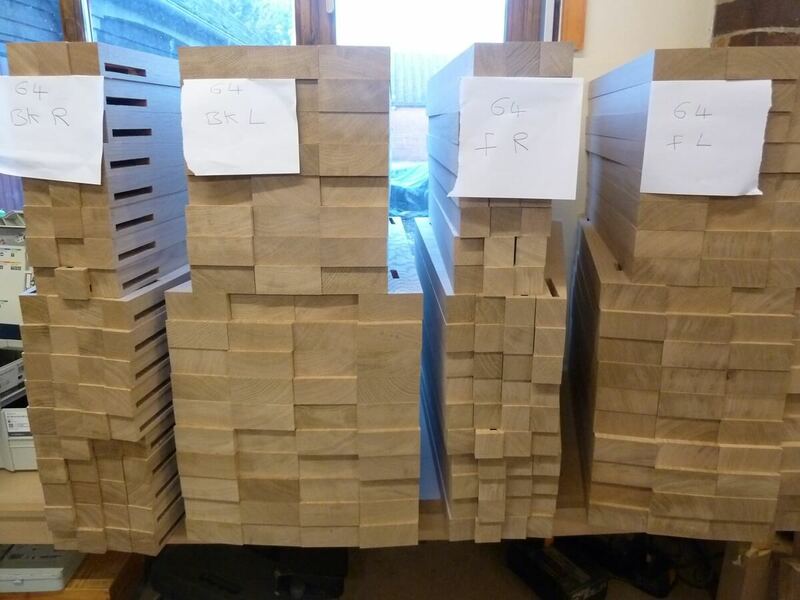 This meant we had a first lorry full of oak arrive before Christmas, with two more straight after we got back in January. 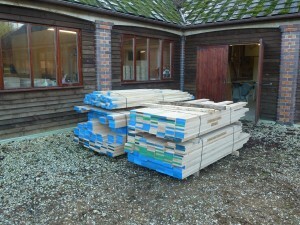 It’s the biggest timber order we’ve ever made – around 300 cubic feet of wood. It was a test of how the workshop would run under real pressure, on paper at least we didn’t have enough time to make it all , but we were confident we could put the hours in. We took on two new members of staff to help with the job, Harry who had done a short internship with us in the summer and Dale, who’d trained on David Savage’s furniture course last year. They slotted in quickly with the existing team and before long there was a real buzz coming out of the workshop, both in terms of machine noise and spirit. Having never made 60 plus of anything so large we were not sure what kind of time saving this would produce, as a one-off the desk would have probably been a 45 hour make. We assumed we would half that. In the end we did even better, good news for us because the costs were always very tight on the project. In terms of manufacture – things went really well, probably better than we could have hoped for. We finished on time and on budget. The biggest challenge was the logistics of moving stuff around and storage. Although we were finished by early March site was not ready so many of the desks would end up in a warehouse for months after. Our original schedule had us working on a large contemporary kitchen for a property in Poole after the Oxford / Makers Eye job, but as is often the case this slipped back by a few months so we found ourselves rejigging the order of projects. We’d been discussing a large dining set for an existing client and this was the one that would now fill our big hole! It’s not just any old dining set though. This was going to be the biggest round table we had ever made, out of the most beautiful English walnut log we had converted ourselves back in early 2013. In the meantime it had been kiln-dried by our friend George Morgan and was now ready to use. The story and images of the conversion of that log are also here on the STP blog. 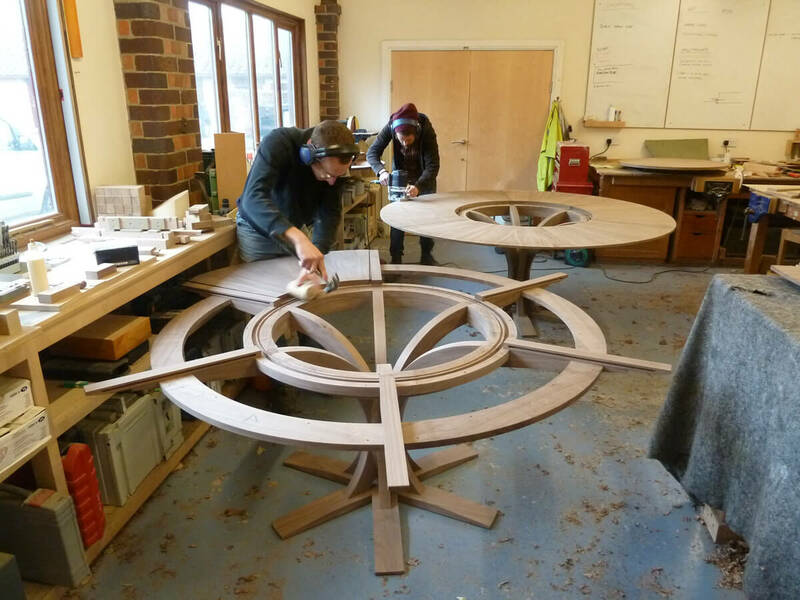 The table is 2.0m in diameter with a spinning lazy susan centre. 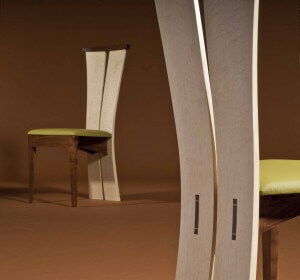 The outside has 6 leaf segments that fix into the top frame, this top frame becomes the elegant laminated leg and pedestal structure. The idea was for the table to appear like a growing tree. 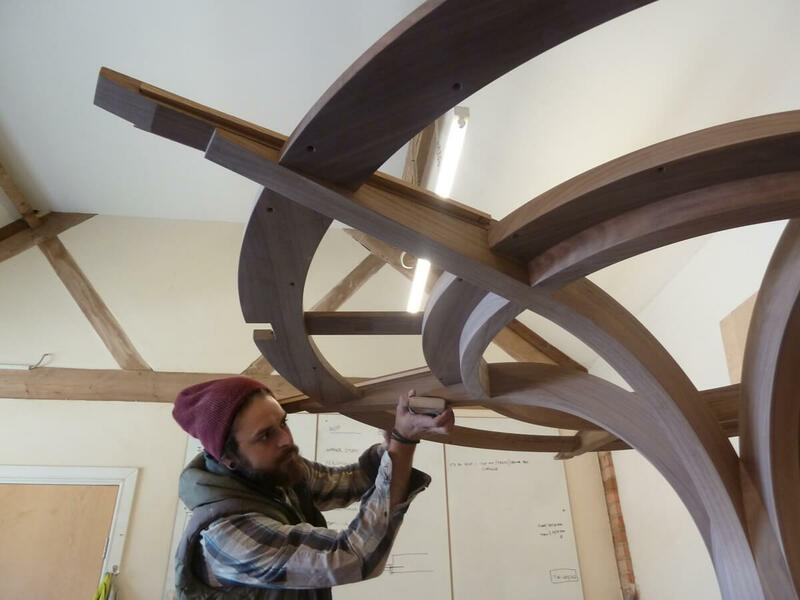 It was a very complicated bit of design and making, and being that we only had enough English walnut to do it once, we choose to build another table in American black walnut as a prototype, albeit an expensive prototype! So we ended up making two of these huge tables, one just ahead of the other, testing the joints and geometry on the black walnut version before committing in English walnut. What we ended up with was two stunning tables, similar at a glance but very different in their subtle character. I’m such a fan of English walnut that nothing really compares for me. We had converted this tree and knew it intimately, we then matched it to great clients who really appreciated it as something special. But this was to be a dining set, so we still had the 10 chairs to make as well. These were to be our new ‘Gabriel’ chairs. I say new, we actually made the prototype pair back in 2012 and then failed to sell any! All of a sudden we had this set of 10, as well as another set of 6 to go into the kitchen in Poole we are making next. It made sense to run both sets together. So we have 10 in English walnut with sycamore backs and six in black walnut with elm backs, both lovely combinations. 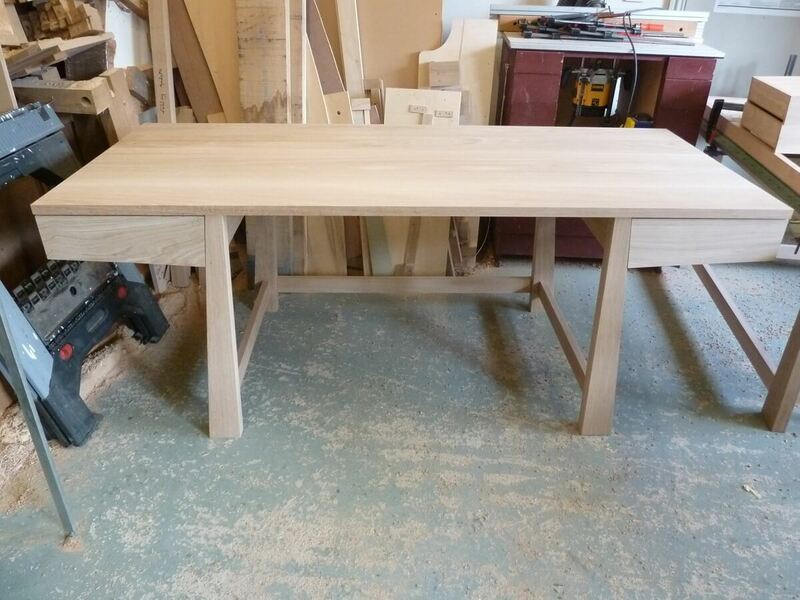 The walnut and sycamore set to go with the dining table are being pushed to be finished before the others because they will be the centre piece of our forthcoming Dorset Art Weeks show (24th May to 8th June). The clients have kindly allowed us to exhibit this exceptional commission before it gets delivered, so if want the chance to see it make sure you visit us during DAW 2014, more details by clicking here! As well as these big commissions we have also been busy doing lots of smaller items, some have been really interesting and challenging. We have had a series of plinths to make for the sculptor Simon Gudgeon, who’s Sculpture by the Lakes gardens are just a few miles away from us. The one illustrated here is for ‘Isis’ a bronze bird piece. 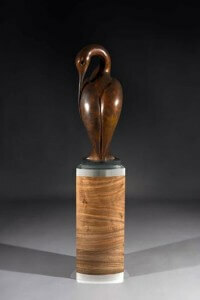 The plinth was made in English walnut with stainless steel ends. Makes a pretty striking impression. We also developed a series of small ebonised oak end grain plinths for a series of animal skull pieces by Simon. 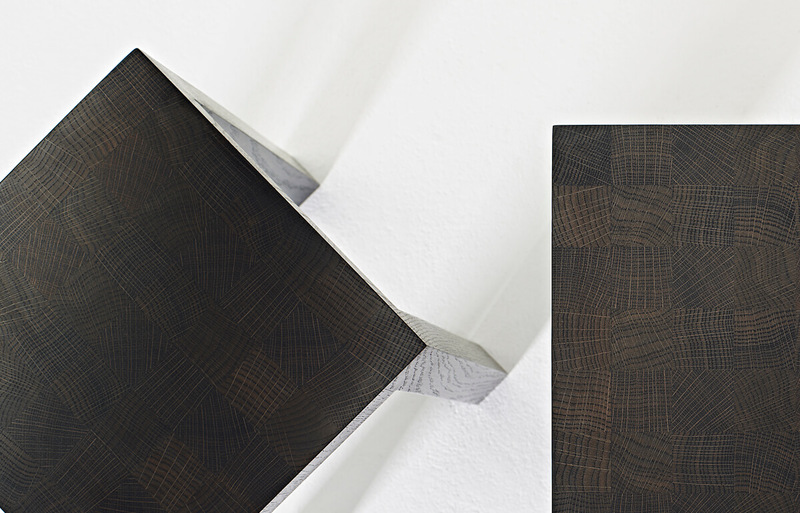 This led us to experiment with the same finish on a series of small side tables. We are still playing around with them and will gauge reaction to those during DAW as well. They may well end up as a regular product if the feedback is good, watch this space.